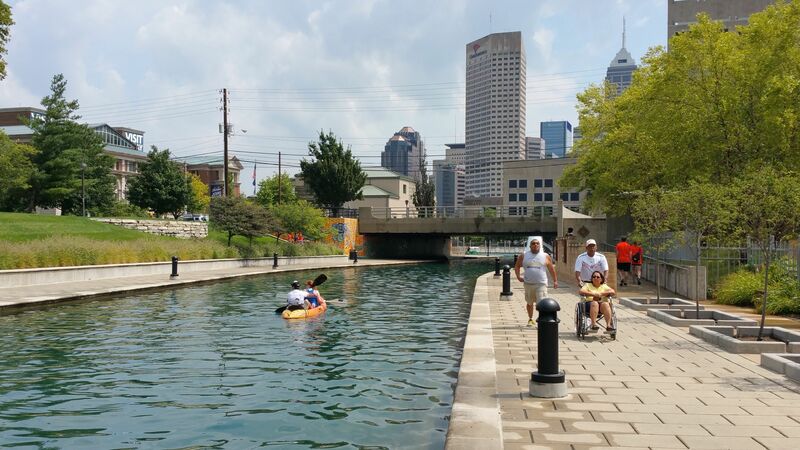 Kayak on the canals of White River Park n downtown Indianapolis. 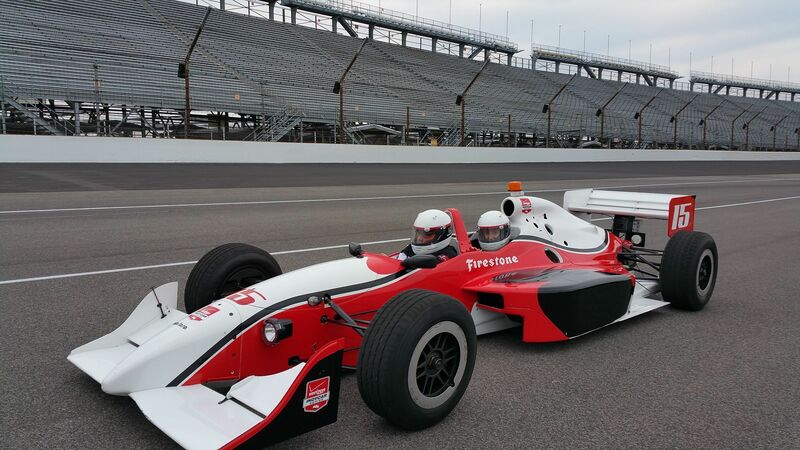 Be a passenger on a thrilling ride at the Indy 500 Motor Speedway. Charles Manson was imprisoned in the Hamilton County Jail as a teen. The heart of the Midwest and a city to emulate, Indianapolis is leading the region’s efforts in sustainable development and wellness. It’s a place where families find electric ride-share vehicles, organic farm-to-table cuisine and educational institutions advocating social change — and it’s not the only progressive place in this surprising state. Called the “Hoosier State” after what’s said to be slang for friendly farmer types, Indiana is also packed with kid-pleasing experiences to enliven any road trip. Choose Indiana for your next family getaway, and you’ll be amazed by the state’s top value attractions and educational treasures. 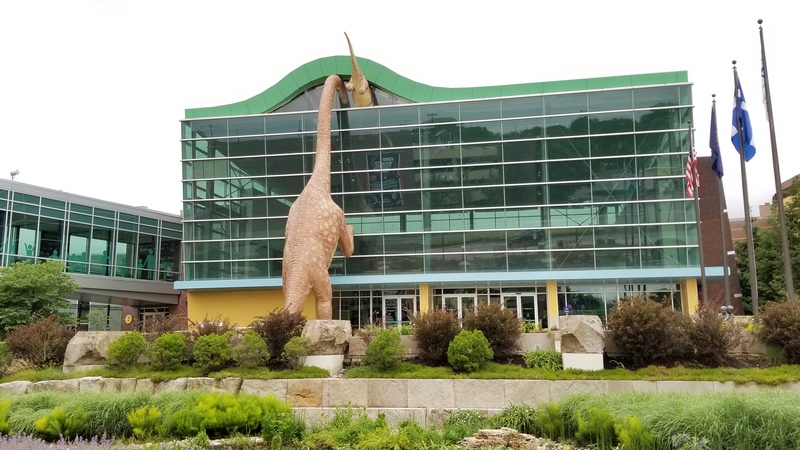 An Apatosaurus tries to enter The Children’s Museum of Indianapolis by an upper floor. The Children’s Museum of Indianapolis is not to be missed. In operation since 1924, this museum is committed to interactive discovery and broadening kids’ horizons both socially and culturally. The calibre of this work is extraordinary for a museum this size but, then again, this is the largest children’s museum in the world. Exhibits like Beyond Spaceship, curated by former NASA astronaut Dr. David Wolf, include an amazingly realistic version of the International Space Station (ISS) which is turning 20 this year. Visitors monitor scientific experiments, enjoy the “view” in the ISS cupola courtesy of real NASA video, and sit in a replica of the Russian Soyuz capsule. If that’s not enough to interest all ages in science, there’s plenty more to explore. Dinosphere has one-of-a-kind dinosaur skeletons like a Draconix Hogwartsia (which the museum named for Harry Potter’s school), and you’ll be closer to it here than in any other collection in the country. Authentic fossils and a digging space provide plenty of hands-on learning, as professionals in the fully stocked lab analyze new finds from ongoing digs in the West. Toddlers head upstairs, to a Dentzel carousel from 1917, big Playscape with waterplay section, and a ‘how things work’ zone for ages birth to 5 years. Glass sculptor Dale Chihuly takes over the central atrium with the 43-foot-tall, 18,000-pound “Fireworks of Glass” that you can see from the top, sides and even underneath, where a rotating bench allows visitors to lay back and appreciate its kaleidoscopic effect. Galleries explore the 150-year-old Reuben Wells steam engine, the extensive Pop Culture collections ranging from “Star Trek” to Barbie, and a “Hot Wheels” exhibit pays homage to the state’s motorsports racing heritage. What’s unique are the permanent galleries that explore religion, ritual and tradition. There’s a moving exhibit devoted to the obstacles endured and eventually overcome by children Anne Frank, Ruby Bridges (an African American child subjected to the perils of desegregation in 1960) and Ryan White (a boy who fought to be admitted to school after he was diagnosed with HIV Aids in the 80s.) This is a place to engage and connect with each other, if only at special events. Museum entry, just $5 on the first Thursday each month from 4pm-8pm and free on several school holidays, includes the new outdoors Sport Legends Experience campus and indoor sports arts wing. The football Sports Legends Experience is training ground for all ages. Everyone knows Hoosiers love their sports. 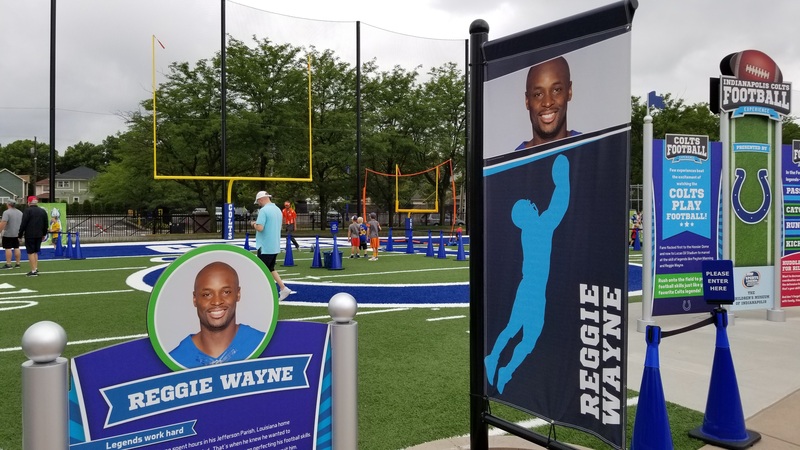 Because the Children’s Museum of Indianapolis is dedicated to educating young visitors about health, nutrition and fitness, they expanded in March 2018 with the Riley Children’s Health Sports Legends Experience (also known as SLE) to a 7.5-acre campus next to the current museum. Visitors who don’t realize hoops are used in basketball and croquet as well as earrings will appreciate the thoughtful approach to sports and physical fitness, all presented as pure hands-on fun. Outdoors, in tune with sports-mad locals, there’s a basketball experience with graduated equipment for players of all sizes. Just watch the little ones shoots hoops against the dads who come to hang out here after work! You’ll encounter a field of football dummies in Colts uniforms to practice tackles on. The street hockey experience has a display about Wayne Gretsky who scored his first minor league goal in Indy. There is pedal car racing inspired by the Indy 500 track, and a mini drag strip. The Pete and Alice Dye Golf Experience boasts putting greens that replicate some of Dye’s most famous holes, and other spaces are dedicated to tennis, baseball, fitness, jogging and soccer. There’s even a 60-foot-tall Fantasy Tree House of Sports that lures preschoolers inside to explore. The Avenue of Champions lined with life-size bronze sports heroes is an ideal spot to take selfies and learn their stories. On some evenings, the museum stays open late so adults can enjoy a drink and friendly competition under the setting sun. The indoors National Art Museum of Sport features artwork that captures the spirit of sport and motion, with scheduled workshops led by local artists so kids can create their own. Other exhibits introduce the hard work, training and perseverance required by top athletes, with an NCAA Training Facility, an homage to Indy racing; plus an interactive History of Hoops floor where visitors can try to replicate the footwork of Indiana Fever star Tamika Catchings. So, lace up those sneakers and get moving. In addition to a very highly regarded University of Indiana campus, Bloomington is home to the WonderLab Museum of Science, Health and Technology. At this very unusual kid-oriented center, there is an animal habitat and 50 interactive exhibits, but we found the Brabson Discovery Garden open to those under age 6 really special. Meet live animals, explore the Kaleidoscope Cave and climb a treehouse. You’re so close to the IU Bloomington Campus that it’s a worth a walk to see its lush landscaping and distinguished Indiana granite architecture. Go urban in the heart of downtown Indy at White River State Park, built around canals and the White River. A truly successful urban redevelopment project, it boasts museums, gardens, an IMAX theater and a large outdoor concert venue. You can explore the park via multiple means of conveyance — on rental bikes, by Segway tours, aboard a gondola or electric boat with Old World Gondoliers, or self-propelled pedal boats and kayaks. Start your tour at the Visitor’s Center for maps and information. Indiana is known for its beautiful lakes, and the largest one is in the southern part of the state outside Bloomington. Lake Monroe State Park is a 16.8-square-mile reservoir open for boating, fishing, hunting and camping. Its only waterfront resort, Fourwinds resort will feed you lunch and rent you a boat to enjoy it. Take one of their speedboats or a leisurely pontoon boat that can fit your whole group and see what the fuss is about. Indiana Dunes State Park, on the state’s Lake Michigan shoreline about 3 hours north of Indianapolis (Indy for short), is very different. This lake is unbeatable for a Midwest beach day. On summer Thursday mornings, there are yoga classes near the sand beach pavilion and a fun, Three Dune Challenge any time, for those who want to ‘race’ each other up the sliding sand on a 1.5 mile sprint to bag each peak. The Indianapolis Zoo is part animal habitat, part conservation center: an aquarium whose dolphin show is focused on environmental preservation, an ocean touch tank and a botanical garden. We were enthralled with the International Orangutan Center, a glass-walled scientific research facility where audiences can watch as eight resident orangutans are coached to practice their ABCs; more literally, to use a touchscreen to identify objects whose names they’re studying. Talk about stressing the importance of education. There are also special opportunities (with additional fees) to experience an elephant painting with his/her trunk, have an in-water dolphin experience, or do zoo camp. Designed for preschoolers, the Fort Wayne Children’s Zoo boasts a large aquarium recreating Australia’s Great Barrier Reef with clown fish and Nemo’s friends, with a special shark area nearby. Lions, hyenas, wildebeests and giraffes inhabit the African Journey section, just part of the zoo’s 200 different species. By the way, Fort Wayne has a big selection of low cost and terrific family attractions, plus a library that focuses on genealogy and is guaranteed to bring the family closer together. 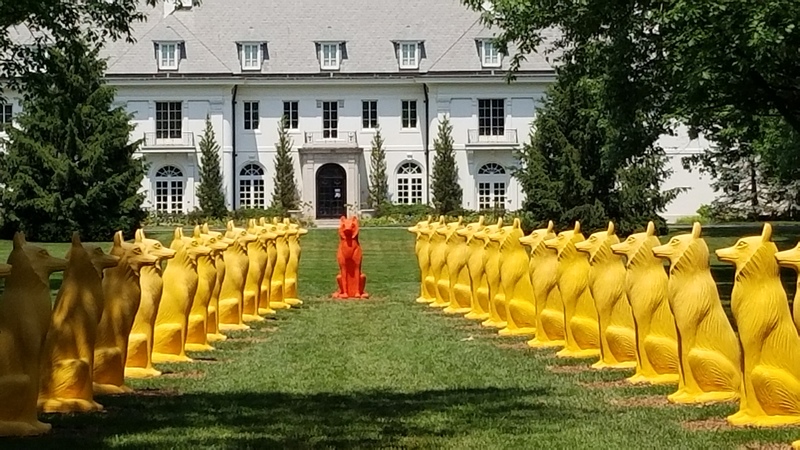 Oldfields, the Lilly estate, displays Newfields’ summer 2018 recyclable sculpture from Cracking Art, Italian artists working on environmental issues. All ages will enjoy Newfields, formerly known as the Indianapolis Museum of Art. Considered one of the tops in the country, the museum and its collections still reside in the gardens, wooded trails and buildings of the Lilly family Oldfields estate, so it was renamed to incorporate the whole experience. Newfield’s Fairbanks 100 Acres art and nature park is free to the public and showcases unusual sculpture, including Funky Bones, a work popularized by the best-seller “The Fault in Our Stars.” The art museum displays almost every era of Western, European, African and Asian art — as well as hometown hero Robert Indiana’s original LOVE sculpture — so it’s a good overview for infrequent museum-goers. If you’re with preschoolers, ask the reception desk for their family guides and location of the interactive children’s areas. The Eiteljorg Museum of American Indians and Western Art, which houses a stunning collection of both Western Art (think Georgia O’Keefe and Charles M. Russell cowboy bronzes) and, at an equally high calibre, Native American Art such as painted teepees, headdresses and beadwork, ceramics and more — is really special. Their lower level Discover Junction features a stagecoach you can climb in, puzzles, and dress-up, and parents can use the educational Family Adventures Pack to explore. Don’t miss the back terrace which opens onto the city’s popular White River Canal, where you can stroll, rent a boat or just sunbathe. The other museum in the park is the Indiana State Museum, which includes artworks from each of the state’s 92 counties as well as a three-story overview of Indiana’s history. By the time you leave, you’ll be an honorary Hoosier. Wanna Race the Indy 500? 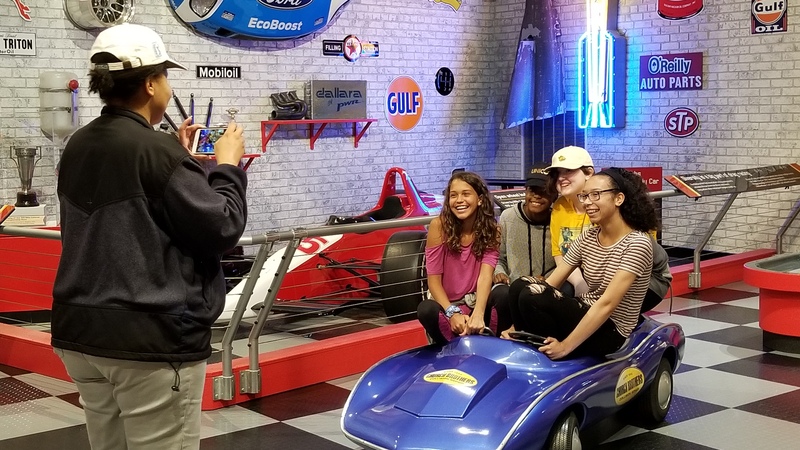 Tne Indy 500 Race and the region’s famous race car industry are celebrated at The Children’s Museum and throughout the state. You don’t have to be a car guy to appreciate IMS – Indianapolis Motor Speedway Hall of Fame Museum; it houses one of the world’s largest collections of trophies and super slick Indy (long nose) racecars dating back to 1911. Now imagine being part of one of the most famous auto races in the world, the Indianapolis 500, which draws over 400,000 people each Memorial Day. All ages can suit up and join the guided tour around the 2.5-mile-long track with a professional driver, and visit the museum. For $500, Indy Racing Experiences will drive you at 180 mph; , and you can even drive yourself at up to 120 mph behind a pace car if you’re willing to pay more. Be sure to pause at Brickyard Crossing where winners traditionally kiss the finish line, it’s fun. Too fast for you? Play the four holes of a Pete Dye golf course contained within the enormous stadium. 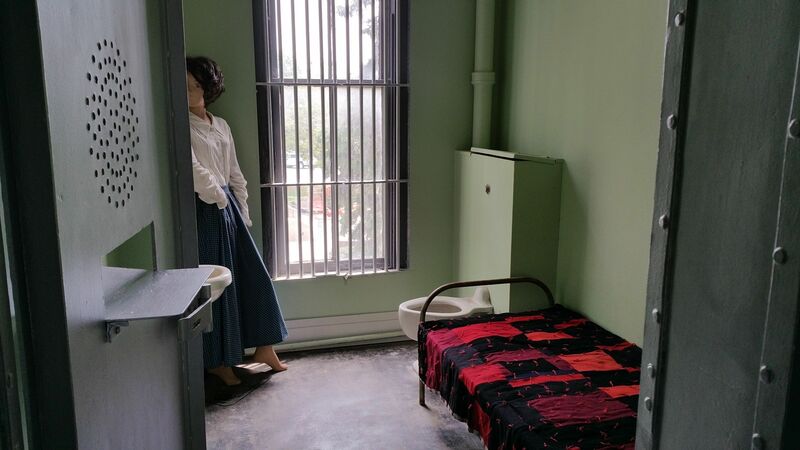 One favorite outings is to little Noblesville, a haven for vintage collectibles dealers and flea markets circling a picture-perfect Midwest courthouse and county jail that numbers John Dillinger and Charles Manson in its guestbook. Noblesville is also home to the Indiana Transportation Museum which does historic train excursions on weekends. If you want to explore more of the state from a rural base, think about the city suburbs. Carmel, in posh Hamilton County — one of America’s fastest growing communities — has great restaurants, galleries, and the kid-pleasing Monon Rails to Trails bike path, which runs all the way into Indianapolis. Hotels can be better value for families and one we like, with its own small pool, is the Renaissance Indianapolis North Hotel in Carmel. For more information about road trips in Indiana, go to Visit Indiana, Hamilton County Tourism or the Indianapolis Convention & Visitors Association websites. Every generation will get involved at the Conner Prairie Interactive History Park, about 10 miles north of Indy in Fishers. Within the park’s 200 wooded acres are four themed historic areas including the original Conner house, offering interactive learning experiences that are just plain fun and illuminate life in the 19th century. There’s much more going on in the Welcome Center too. Activities range from Native American tomahawk throwing to language learning, the science of windmills to pie making, kids’ games to helping a carpenter. Costumed interpreters and area volunteers greet visitors to every section, encouraging the “look, touch, smell, taste and hear” approach to history, a concept that Conner Prairie has perfected over many years. Their intense “Follow the North Star” experience (held in April and November only), which puts participants in the role of runaway slaves on the Underground Railroad, is said to be a very powerful way to connect with prejudice — and keep issues of racism and human trafficking alive — for school age children and older. A sky-high Conner Prairie overview comes from a tethered, helium-filled, 370-foot-high balloon which replicates the sensational 1859 hot-air balloon ride by John Wise -– the first “airmail” delivery in the US. It’s safe for all ages and wheelchair accessible. In summer, all of Indiana boasts concerts and festivals for multiple generations to appreciate and enjoy together, some held as part of “Symphony on the Prairie” at Conner Prairie’s outdoor amphitheater. No surprise that Holiday World Theme Park and Splashin Safari, located at 452 East Christmas Blvd (for real!) in Santa Claus (yes, true! ), go all out for holiday events. From May to October this friendly themepark is a destination for coaster lovers and all ages who appreciate its traditional fun. (Just read this family’s review.) The ever popular ride, Thunderbird, is the first launched wing coaster to join Voyage, their top-rated wooden coaster. The waterpark next door features Mammoth, the country’s longest water coaster ride where several inner tubes can link together. Come back in October and Halloween has overtaken everything. In December, each weekend is devoted to illuminations and performances focused on Christmas. The NFL Colts and its NBA team, The Pacers — in fact, all sports — spell Indiana so you’ll want to attend at least one sporting event during your visit. Summers, minor league baseball is your most affordable ticket, with the Indiana Indians Minor League team (affiliated with Pittsburgh Pirates) playing at Victory Field in Indianapolis. We love this park for its city skyline views and liberal picnic policy, so you can go in and out on the big lawn and chow down from local foodtrucks during the 7th inning stretch. Bosse Field in Evansville, the much-filmed League Stadium in Huntingburg, and Parkview in Fort Wayne are all popular minor league parks where ticket prices are cheap and tickets are more easily obtained. During March, you probably know to avoid the college athletes’ temple, NCAA Hall of Champions, but the two-story interactive museum in Indianapolis is a fun visit the rest of the year. 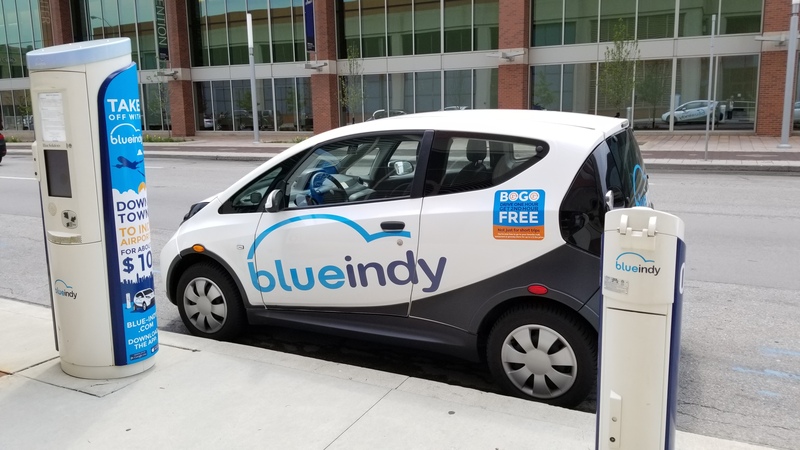 BlueIndy electric cars are set up at charging stations all over the city for short term use by members. Start your Indianapolis tour with cheap transportation. Check out the ride-share bikes known as Pacers, widely available downtown for $8/day and enjoy the wide, paved Culture Trail Bike Route. Hop the Blue Line buses ($2) with IndyGo and wind your way through downtown. You’ll see major attractions including White River State Park, City Market, Victory Field, The Indiana Convention Center, Circle Centre mall and more. For an easy way to get around Indianapolis, hop aboard the Blue-Indy electric car service, launched in August 2015. Since then, it’s grown to, offer visitors an electric rideshare program at the swipe of a membership card keyed to one-day, -week, -month or –year memberships. Their app allows you to reserve a car or a parking space, so it’s most cost-efficient for short trips and getting to and from the airport. With up to 91 charging stations and 500 cars in town, this is a great resource for outings, and typical of the innovative approaches used for sustainability and mobility.